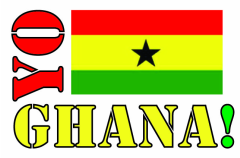 Yo Ghana! is a 501(c)(3) nonprofit, run entirely by volunteers. Please consider a tax-deductible contribution. Most of our budget is devoted to supplementing school-improvement programs, such as helping students at Anani Memorial International School, shown here, pay their fees, or funding the annual conference at the University of Education, Winneba, for our Ghana students, teachers, and administrators.